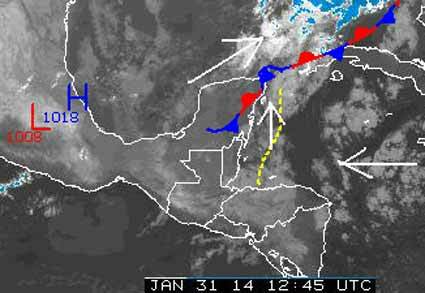 Belize NMS: Cool weather conditions prevail across the country. Isolated showers or light rain possible today. .Winds will be light west to northwesterly this morning and then easterly this evening, maintaining generally calm seas. 24-hour forecast: Sunny with cloudy spells today and clear at times tonight. There is the chance of isolated showers or light rain affecting coastal areas today. Winds: West - northwest 5-15 knots, becoming easterly this afternoon. Today: Winds: W-NW 5-15 kts..Becoming e'ly this evening. ; seas: Light chop - choppy. ; waves: 2-4 ft.; chance of isolated showers or light rain. Tomorrow: Winds: E-SE 10-20 kts. ; seas: Choppy - moderate. ; waves: 3-6 ft.; chance of only isolated showers. Marine Outlook: Saturday night:- winds: E-SE 10-20 kts. ; seas: Choppy - moderate. ; waves: 3-6 ft.; chance of only isolated showers. General Outlook: For Saturday and Saturday night is for generally fair weather to previal with only isolated showers. Looks generally fairly stable. ..Very few isolated showers out over the Sea. Looks like this overcast sky will burn off to give some sun today, probably no rain.